The Northward Migration: when does it end? There are numerous unanswered questions about monarchs. What causes the migration to start in the fall? Why do they fly to Mexico? Why do the overwintering colonies form where they do? Why do the monarchs halt their southern flight at 19.5N? Why not go further? These, and other unanswerable questions, are asked of us frequently. We have to admit that we don’t know the answers but offer speculation and a best guess when we can. Curiously, though many of those we talk to know that monarchs do not continue to migrate through the heart of the breeding season, no one asks – when does the northward migration end in the spring and early summer? Well, it’s a good thing no one asks that question — because we don’t know the answer to that one either. So when does the northward push by first generation monarchs* end? If there is a celestial component to when monarchs stop moving such as day length or the rate of change in day length or some other factor, is it possible for monarchs to arrive too early in the northern latitudes such that they fly beyond the limits of milkweed? Or, the converse, do conditions during some springs limit northward flight such that the monarchs do not reach the northern limits of milkweeds? In other words, is it possible during extremely cold springs that the “stop signal” whatever it is, is perceived before all the breeding habitat is effectively colonized? I think both things happen but I can’t argue effectively for these possibilities because there is virtually no data on this subject and relatively few credible observations. Years ago I directed one of the undergraduate students I was working with to make daily observations of directional flight by monarchs moving through this part of eastern Kansas in late May and early June. To our surprise, all directional flight appeared to end around the 5-7th of June. Monarchs present in the area were decidedly non-directional after the 7th. Day length is 14h 49m here on the 7th but the amount of change per day is declining rapidly (47 seconds from 7th to 8th) as we approach the summer solstice on the 21st. On that day the daylight period is 14hrs and 54 minutes. This observation raises some questions. Do monarchs stop moving when the rate of change in day length drops substantially below a minute per day, and does this mean that monarchs stop directional movement progressively with increasing latitude? The day-to-day differences become progressively smaller as one approaches the equinox. For example, at Duluth, MN, day-length increases by 25 seconds on the 14th and by only 11 seconds on the 18th. Note that the rate of change (less than 50 seconds per day) shifts from the 7th to 8th for Lawrence to the 9th-10th for St. Paul. Thus, if migration northward ends as a function of latitude and rate of change per day, we would expect the most northerly monarchs to still be showing directional flight even though directional flight has stopped further south. This is certainly an interesting possibility but we need data and, as I said, there is virtually none. So here is where those of you making observations of first sightings can help. 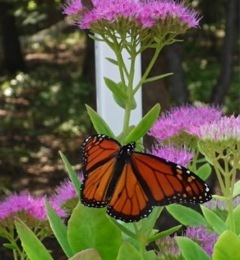 If you see a monarch, note its flight behavior. Is it nectaring, searching for oviposition sites or is it showing directional flight? And, if it is showing directional flight, what direction is it moving – that is, what is its compass bearing (approximate bearings would do for a start**)? Directional flight is particularly difficult to observe in the spring. In most cases the butterflies are flying quite fast at a height of 3-4 meters. If you are driving on east -west roads during May and June look for monarchs crossing in front of you from S to N (or NE) at a height just above your car or pickup. Observations of directional flight are valuable and will further our understanding of monarch behavior. Such observations could be shared with our email discussion list (Dplex-L) or reported to Journey North. Systematic studies by students or even groups of citizens of directional flight over a series of weeks in the spring and early summer at different latitudes could resolve this question. An alternative approach would be experimental releases with monarchs that had been reared under specific natural conditions or by using a flight simulator. *First generation monarchs are offspring of monarchs that overwintered in Mexico. The first of these monarchs begin moving north in the last week April, with most moving north in May and early June. ** Many smart phones have a compass app available to them. To obtain the bearing of a monarch moving directly away from you, point the phone at the monarch and take a screen shot of the compass. The image should be time-stamped and may even include latitude and longitude so it can be reviewed later. Visit the Monarch Watch Blog website.